Are you looking for a nice villa only few minutes from the beautiful beach and a beautiful view? Than is Villa Treumal the one you are looking for! This modern villa has everything you need for a fantastic holiday! Villa Treumal is modern decorated, has a pleasant atmosphere and consists of three floors. The ground floor is the garage. Here you can park the car. Next to the garage is the laundry room. From the garage you can take the elevator up or take the stairs next to the first floor of the villa. On the first floor you enter the nicely decorated living room with fireplace. The living room has large picture windows, so you can enjoy the beautiful view! The living room has a large dining table where you can dine together with the whole family! Very special detail in villa Treumal is that your private pool (6m - 4m), living and lounge area are all the same level! From the living area you can enjoy your delicious dinner or lunch, while the others have a swim in the pool to cool off! Catch in the morning the first sun rays on your terrace while drinking a coffee and enjoy the beautiful sea view. That´s holiday! There is a spacious kitchen with all equipment to prepare a nice dinner for the whole family! On this floor you also find a two persons bedroom and one bathroom. The remaining three bedrooms are on the second floor of the villa, all with an incredible view over area and the sea. Two of the bedrooms have a double bed, third bedroom has two single beds. This level of villa Treumal is also reachable by elevator! Behind the house is a lovely large and terrace, completely private. The place for a nice barbecue with the family. It´s a very nice covered terrace as you can see on the photos. Besides the fact that this is a a fantastic holiday villa, the location is very good! Less than 8 minutes and you are at the beautiful beach of Treumal! This small and quiet beach can by reached by a small footpath through the forest. 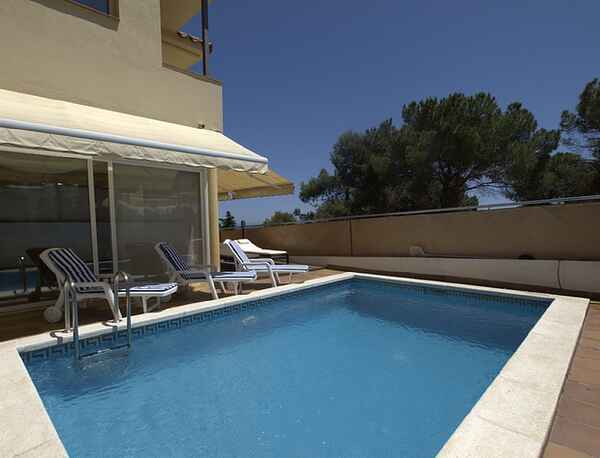 The villa is located between the two charming villages Lloret de Mar and Blanes. By car it takes 5 minutes in the centre of Blanes and within 7 minutes you are at Lloret de Mar. Villa Treumal is a 8 person holiday home with private pool, 4 bedrooms and 3 bathrooms. It can become a 10 person holidayvilla by adding 2 beds, for an additional charge. You can find Villa Treumal in Blanes, in the urbanisation Santa Cristina, Costa Brava, Spain. The holidayvilla is around 850 m from the beach. About pets: small pet, a car is necessary. The pool has a size of 4m x 6m, the pool's depth is 2m. The plot has a size of 500 m2.The total floor space is around 200 m2.